Turn your event into a spectacular! Chances are, if you've spent much time on this site, you've seen this beautiful, hand-painted backdrop. Did you know that it is available for your Christmas events? Or, any time of year, really! 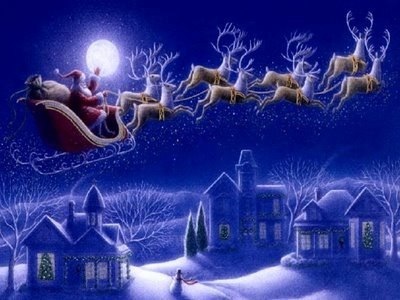 And you can rent it whether our Santa is attending your event or not. We have other Christmas props, too, including the Ginormous Santa Chair®, the portable throne (also pictured above), North Pole sign, full and half-trees, and more. Coming soon, a red-and-white lifeguard chair and a beach background for Christmas in July. Send us an e-mail and let us help make your event a Christmas Spectacular! Santa came upon a unique opportunity this Summer, the chance to buy a mall-sized Santa Chair. This picture, taken at the seller's retail-furnishings store, doesn't do it justice, it is ginormous! I have spent weeks developing a delivery crate that will allow one man with a winch and ramps to load and unload this beast on a truck. This is the perfect prop for a big event that needs a grand statement piece to anchor the Santa set. 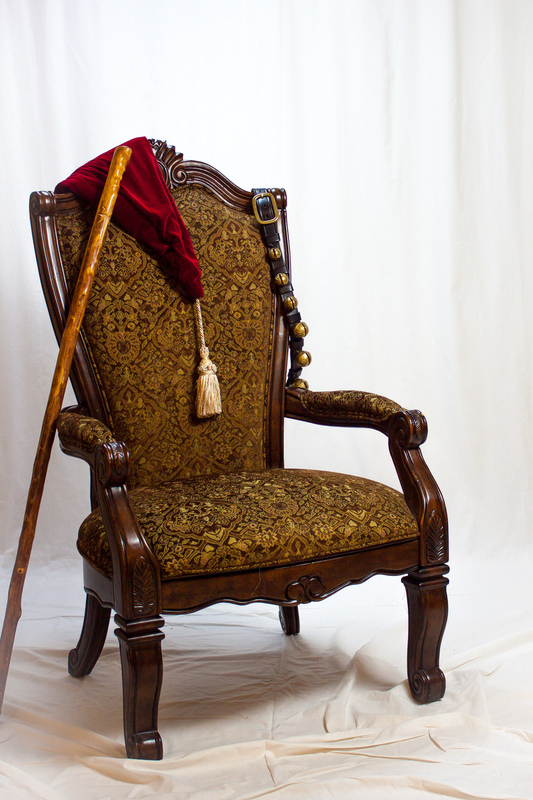 The chair-back is so large it obviates the need for a backdrop! 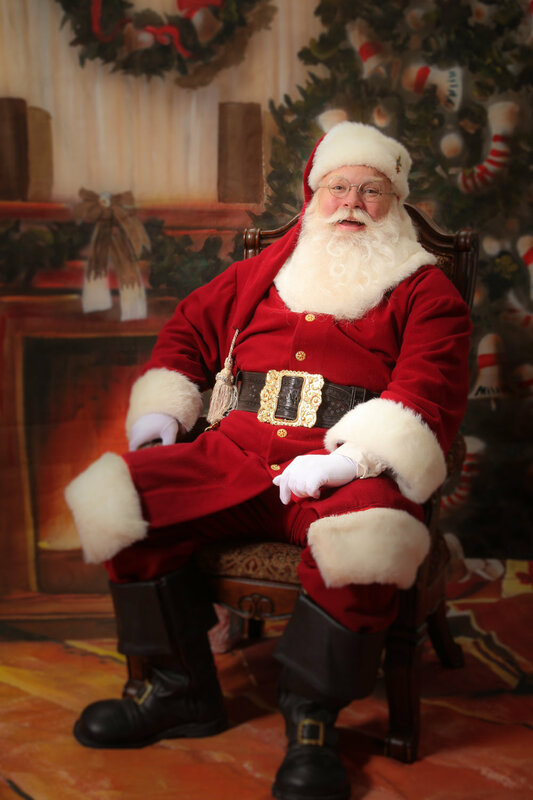 We can provide just the chair, Santa plus chair, or a whole photo operation including preview station and prints on site taken by a professional photographer. Rental Restrictions: Delivery requires a handicapped-accessible venue, with minimum door widths of 48". The chair is delivered on a rolling cart (with non-marring urethane wheels), but if the chair needs to be lifted or carried it takes two strong people as it weighs about 350 lbs. The upholstery is only suitable for use sheltered from the weather and should not be exposed to artificial snow or bubble, which WILL damage the velvet (regardless of what the machine claims). More photos, information and pricing to come soon. Our winch and ramps setup for loading and unloading the. Ginormous Santa Chair® and crate. The top half of the crate has rubber wheels on the back to negotiate the ramp. The bottom of the crate detaches and rolls into the venue, on non-marring urethane casters. As Thanksgiving closes in and the shadow of Black Friday looms large I've decided to look beyond the frenzied bargain-hunting and focus on a friendlier, more comfortable shopping event: Small Business Saturday. I'm looking forward to visiting every local business in the downtown area of my local town, Wake Forest, meeting store-keep and citizen alike, sampling their wares, perhaps finding a bauble or two to place under a tree, and generally enjoying the slower pace of small town life. Just a brief reprieve before I get beck to my own frenetic pace as we prepare for the next big day, now only a month away! Happy Thanksgiving to you, and a most merry Christmas, too. The elves have been busy and ol' Santa will be sporting some new looks this season. New boots and a new belt buckle with SC initials in a beautiful wreath. 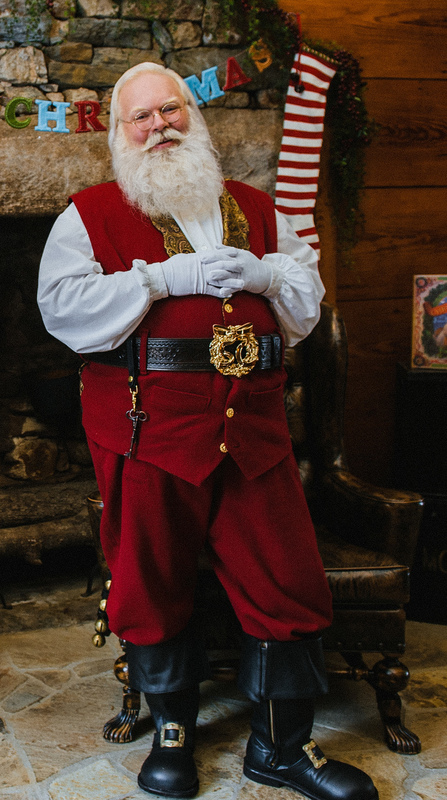 Add that to a more casual "workshop look", replete with puffy sleeved-shirt and snazzy vest, and it will really will help Santa keep his cool even when the temperatures near the Southern Toy Shoppe are not participating! Let's face it, Santa spends a lot of time in chairs greeting many, many boys and girls. It can take a toll on his back and knees if the chair isn't just right. So, we just bought a second chair that is just the right height, and the perfect fit, and looks nice in pictures, too. Well, it’s been entirely too long since my last entry. Of course, I just completed the busy season a few weeks ago and have been taking some much needed rest. It was a very rewarding season though busier than ever. As is my custom, I spent a lot of time visiting the children before my big delivery night, to see their smiles and bright eyes and be rejuvenated by their overflowing Christmas spirit... it reminds me of why I do what I do. You know, I never get to see the smiles on Christmas morning, so I try to do my visits beforehand. So many delightful children, so little time. Thank you to so many that made these visits possible! Santa’s got a brand new belt! Ol’ St Nick has been wanting to upgrade his belt for some time now. I drew out the design I would like and handed it over to a very crafty elf named Steve at Backstreet Leather and this is what he handed back. Boy, if I wasn’t jolly enough already, this would do the trick! The truth about kissing Mommies! It is time to clear the air, and attempt some repair of my character. There are a couple of songs out about me that make me sound like a cad about town when nothing could be further from the truth. I am very committed to my Mrs. How can I dispute the eyewitness of a child who saw me kissing their Mommy, and being tickled beneath my beard, so snowy white? Well, don’t tell the kiddies, but rumor has it that sometimes Daddies will dress up like Santa Claus to surprise their little ones with a visit. Ahhh. So there it is. Reputation secured, and fidelitous marriages assured. While the story of Rudolph’s brilliant navigating nose is the cornerstone delight of many a child’s Christmastime, it can serve as a stumbling stone for older children who question the feasibility of the tale. Well, don’t tell the kiddies, but Rudolph’s nose, though quite red, does not even emit a soft glow. You see, the truth is that most reindeer have shiny, black noses and Rudolph had the most unusual red and bulbous nose you ever saw on a reindeer. The other reindeer were not very nice to poor Rudolph, even excluding him from their games. Old Saint Nicholas doesn’t much like to see anyone receive rough treatment so I devised a plan to take Rudy’s weakness and make it a strength. Knowing that fog was rolling in for our departure, I praised Rudolph in front of the other reindeer on how spectacular his nose was, “Why, I even think it glows. With this fog tonight, I sure think your nose would be a perfect guiding light!” By time we returned from our rounds, Rudy was the toast of the town... a true reindeer hero. The moral of the story: surround yourself with people who love you and can help turn your weakness into a crowning gem!